Cutting-Edge Social Policy Research is a careful selection of the finest papers from the 2004 Social Policy Conference held in Charleston, South Carolina. These presentations from respected experts spotlight the latest and best research on a wide variety of crucial social policy issues. Explanations are provided on how to use qualitative and quantitative methods to research social policy questions, with a clear view on how to apply research results to today’s social problems and programs. Cutting-Edge Social Policy Research discusses various social policy topics, approaches, and the latest high-quality research and findings. Students learn how others have researched the topics using different approaches, while practitioners gain important new information relevant to their jobs and practice areas. Chapters explore vital perspectives, such as how to link program evaluation to policy practice, how clients’ “in their own voices” views bring more convincing rationale to policymakers, and how the “trauma perspective” can spotlight the true effects of poverty, inequality, and oppression in our society. The text includes extensive up-to-date bibliographies and literature reviews. 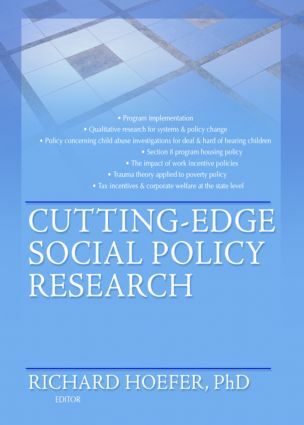 Cutting-Edge Social Policy Research is stimulating, insightful reading for practitioners, educators, and students in social policy, social work, sociology, and political science.